Her family used to live in Bihar, after the division of states, their home is now in Jharkhand. She says the modern cuisine is same in both the states. The tribal or the village food would differ, otherwise, it’s the same food made. I told her that I have been wanting to make Sattu Ka Paratha and asked if the Fried Gram we get here is same as what one gets by roasting chana dal as said by all those sites. She said it is different and also recollected how her mom roasts huge amount of Channa dal that would last them a month or so. They had a big clay stove that’s placed outside the home. She was saying the chana dal they get in their place is different and roasting adds up the flavor. So I was back to square one and was thinking maybe I should become adventurous enough to actually use a clay stove myself and roast the channa dal. After a couple of months, my friend’s mom came down to visit her in Madras. Sure enough, being keen to share the new finds with her mom, she took her around shopping. Would you believe she told me that her mom was shocked seeing the fried gram that is sold in our shops? Until then even my colleague was thinking it is different, only to be told it is the same. So when her Mom went back home, she carried as much Fried gram as she could! Another shocking fact was that many others with whom I shared this tidbit, didn’t know that Fried Gram is got by roasting Channa dal. Well, I rested my case! Coming back to the dish of the day, I got both Bihar and Jharkhand from this friend’s mom. I even took these for her to taste and confirm it tastes just like how they make. Wheat flour – 1 & 1/2 cup. Once it is completely roasted and cooked, takes about 5 – 7 mins. allow it to cool. 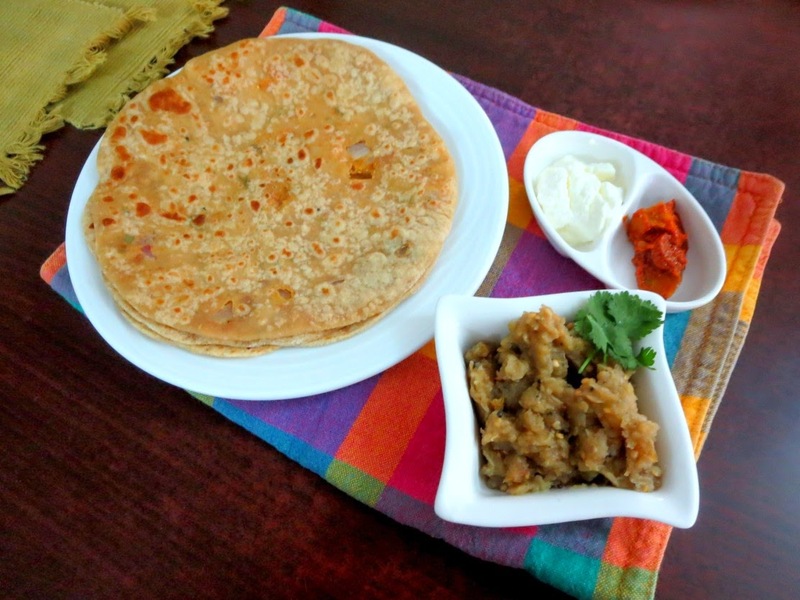 Sattu Ka paratha and baingan ka bharta both looks delicious, Will make this sattu ka paratha once we finished with this BM..Paratha tempts me a lot. Enjoyed this Paratha a lot ..yours combo with bharta looks delicious !! Enjoyed reading the details removing around Sattu Flour. I have never looked for this fried chana dal…I got the flour from Kolkatta. The combo looks divine..and sattu patathas are kind of my favourite. you have an art of writing!! beautifully written about pottukadalai and sattu flour!! enjoyed reading it!! I was expecting this saatu paratha from you,for your bread theme..I too wanted to make saatu paratha but didn't get saatu flour here,never knew roasted gram dhal powder is sattu..thanks for the info..
BTW paratha and baingan ki paratha looks yummy,such a tempting combo. Enjoyed reading your journey for the search of the true Sattu flour. The parathas look delicious. That is an interesting read about sattu. Even I assumed fried gram is sold all over the country as it is in South, or at least in AP & TN. Sattu paratha looks good. Will try it some time. I lightly toasted the fried gram before powering it for sattu. I was waiting to read your story about Sattu flour Valli. I should have asked you before I bought the packet of sattu flour 🙁 But anyways now we all know it is same as putnalu and not some exotic ingredient as it is portrayed. Thank you for clearing that out. 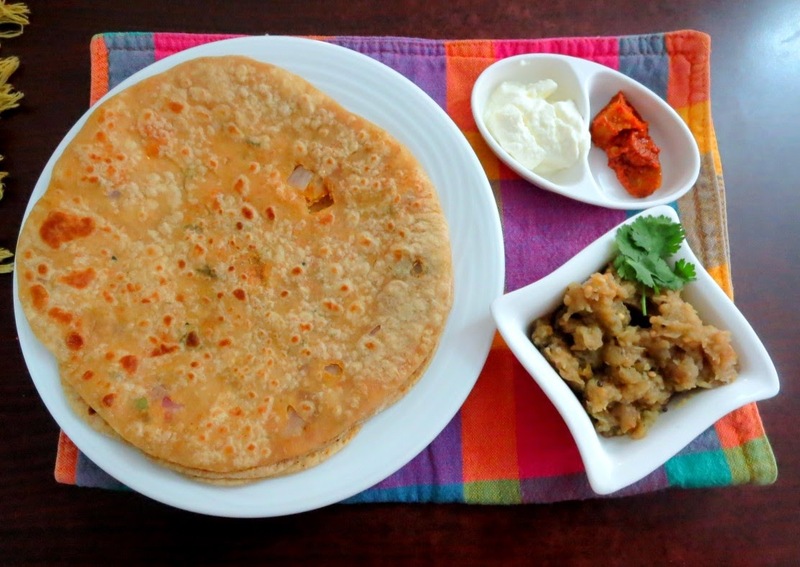 Sattu ke paratha sounds yummy and that bhaingan bharta is calling out my name — will make this combo soon. Good one Valli. I chose the same too but as usual, a different set of ingredients. Interesting to note that putnalu/fried gram is not available in many places. Just highlights how much we take for granted all the things we get !! wow such an delicious paratha to ebjoy this was a delicious one indeed 🙂 make me hungry for some !! wonderful post and love the step wise pictorials 🙂 Paratha is calling me , Pass me some dear !! 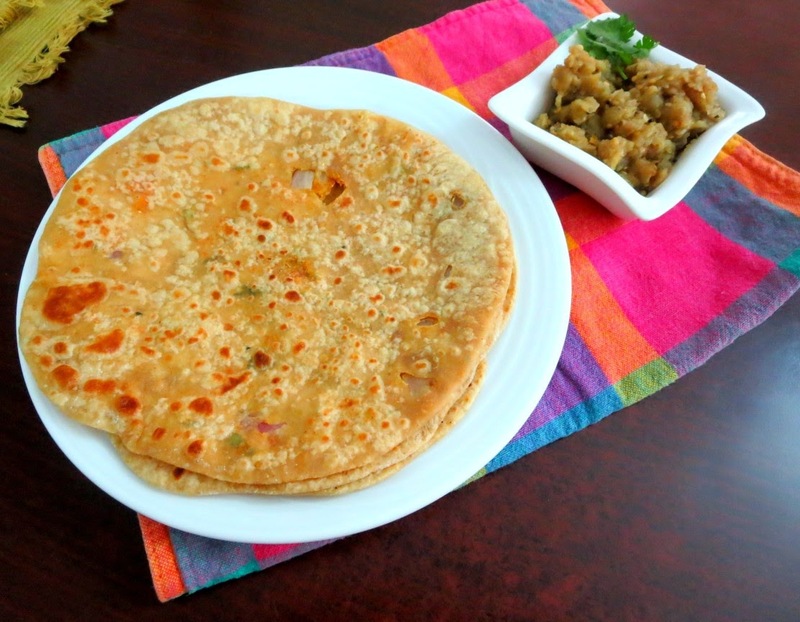 sattu ka paratha was my first choice too – these look truly delish ! love the smokiness of the bharta there…. I loved the mother's reaction to your sattu question :-))…May be they are just used to doing it the old way that using this maynot have clicked at all. My friend was using roasted black chana for making sattu and later moved on to pottu kadalai. Had it not been for Vaishali's suggestion I would have stuck to sattu ke parathe. Delicious they are. Now I need to try them out.Bai ko bahut maska marna padega. Wow! 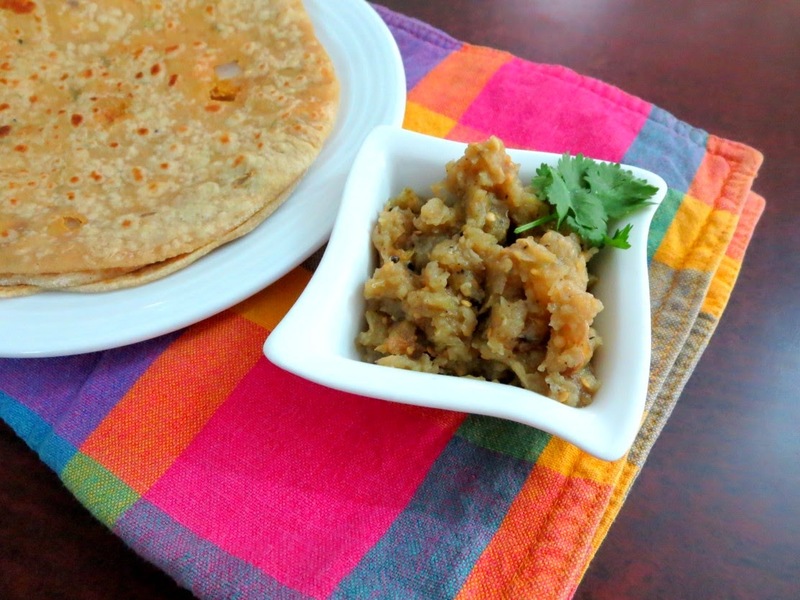 Love the baingan bharta…So quick and easy. Should have tasted great with the flavorful sattu parathas! love how round the paratha's have come, feel like grabbing from the picture. yes, this sattu doubt is there for everyone, but i think we have it cleared in one of our BM discussion. Delicious combo..Love the combination os dishes. Enjoyed reading your post Srivalli. Yours friends mm would have been so relieved to have seen pottukadalai here!I never knew this was not available throughout India!! And the paratha combo looks so good.Must try it.